Cornflower and Queen Anne’s Lace by the gate. High atop the end moraine, the wind whistles in the trees as the horses peer out from their box stalls. 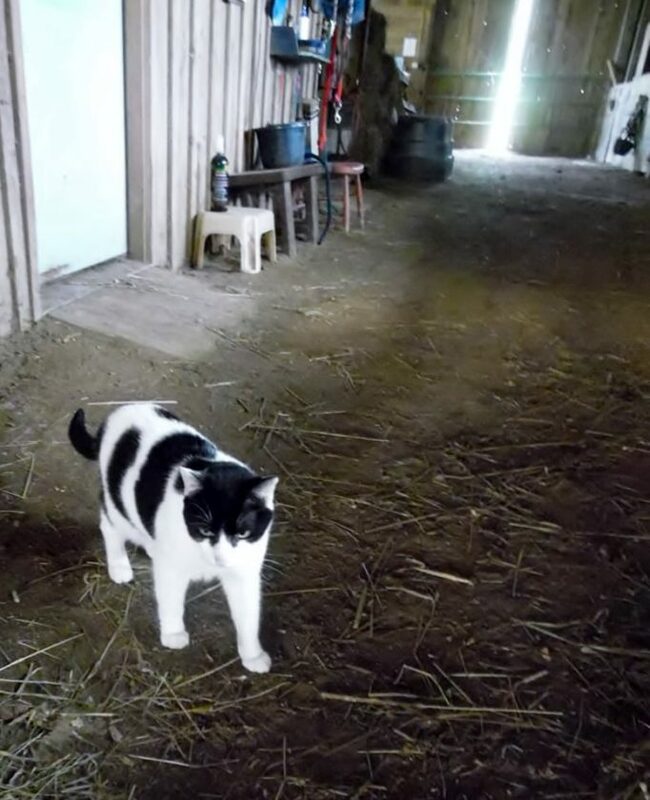 One of many well-fed and happy barn cats. The barn sits at the top of the Westfield escarpment, on a winding road from Sherman to Westfield. It’s at the top of the end moraine, where the glacial left this hill 18,000 years ago in Western New York state, right at the top where the land begins its slope to Lake Erie, the great vineyards stretching out somewhere below. But here, all one hears is wind in the trees. It calls up memory of when my family stayed in a Lake Erie cottage by vineyards, on the shores of Lake Erie. There’s wind memory here. The trees here are huge, six stories tall, taller, beech, maple, raggedy giant hickories with branches like arms waving. It’s a big barn, handsome and natural brown. All around it wildflowers are growing–wild violet purple and white, buttercups, Queen Anne’s Lace, moving in the wind of late August. It’s the last week of August. The last week before Labor Day. Inside the barn I meet horses of various sizes and types. 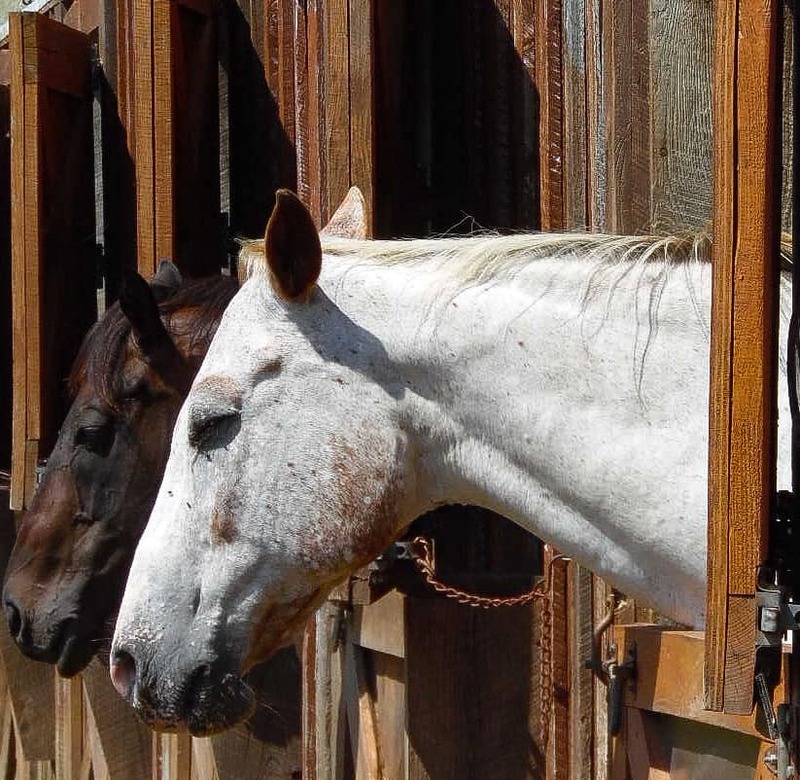 A 29-year-old Morgan Mare, a Percheron/Friesian mix with broad feet large like dessert plates, a hackney mix almost a pony, a sweet little chestnut with a star. There’s a donkey, old and graying, still looking for an apple slice. Zeus is a handsome piebald with a bit of a wild eye. 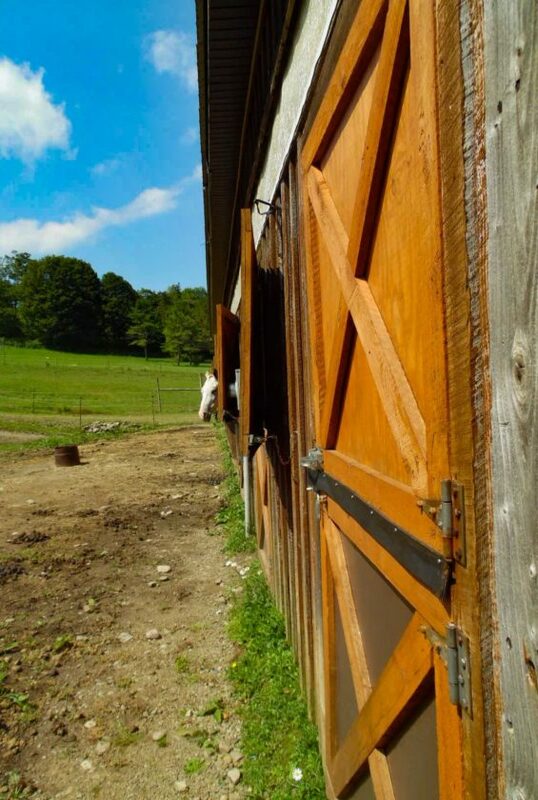 He can get out of his stall by unlocking it with his mouth, I’m told. He’s sassy. I give him a pat. Nearby in their side by stalls are a pretty Appaloosa and a long off the racetrack thoroughbred, his tattooed registry number no longer readable inside his upper lip. He’s a big dappled bay, just the kind I used to ride when I was a young woman as an equestrian. He nickers when I meet him, friendly, glad to meet me. I notice his bottom lip quivers. It endears him to me. Thoroughbreds are high strung though it doesn’t always show. They keep it under the skin. I get that. At one point, this old thoroughbred — now lucky to be in such a kind barn, looks me right in the eye. It’s a melancholy eye, a philosophical eye, kindly, generous hearted. He looks like a horse who has been through hell and ended up safe to his surprise. “There is a touch of divinity … a special halo about a horse, that should forever exempt him from indignities,” Herman Melville wrote. I feel he’s trying to tell me his story as he shifts his great body towards me, blows out gently from nostrils, the spot between them soft as black velvet. He moves gingerly, treating me with great care. He’s got a story to tell, and I can almost hear it. Somehow he breaks my heart this morning in the sweet air. The barn is full of well-fed cats, gray and white, an old calico, a dark tiger named Griffin who befriends me. He sits on my lap awhile and purrs as if I’m his long lost friend. When the riders move off clip clop clip clop deep into the wooded paths, it’s just me here in the barn doorway, listening to the wind. I sit in the sun on an outside bench and recall horses I’ve known. Their depth and courage, their trust in us, I miss them. I will always miss them. But I don’t dare love them again, because like loving a man, like marriage, it costs too much. But this horse, Mr. Saigon, we have bonded. Fella. If I were younger, I’d ride you all the time, and we’d fall in love. And I’d keep you until you disappear into a fine green meadow one day, my bones to follow. The sound of the trees is a symphony of hills and sky and leaves and branches. The sky, the sky, oh, it’s pale blue that says autumn though the sun is hot. The clouds move in from the northwest, cumulus clouds mostly white with some nimbus, grey like old dreams, tops blown off by winds. Wild purple flowers sprout by the road. A car shoots by, throwing up gravel; a monarch butterfly floats past in absolute silence. Then it’s just me. And it’s just me and my memories of showing those mighty thoroughbreds all the years of my youth, horses who would joke with you in their own way, cross tied in their stalls of the vans on our way to horseshows or in the barn, blowing bubbles and grinning with their teeth exposed as if they understood human smiles, moving side to side, anxious to move. 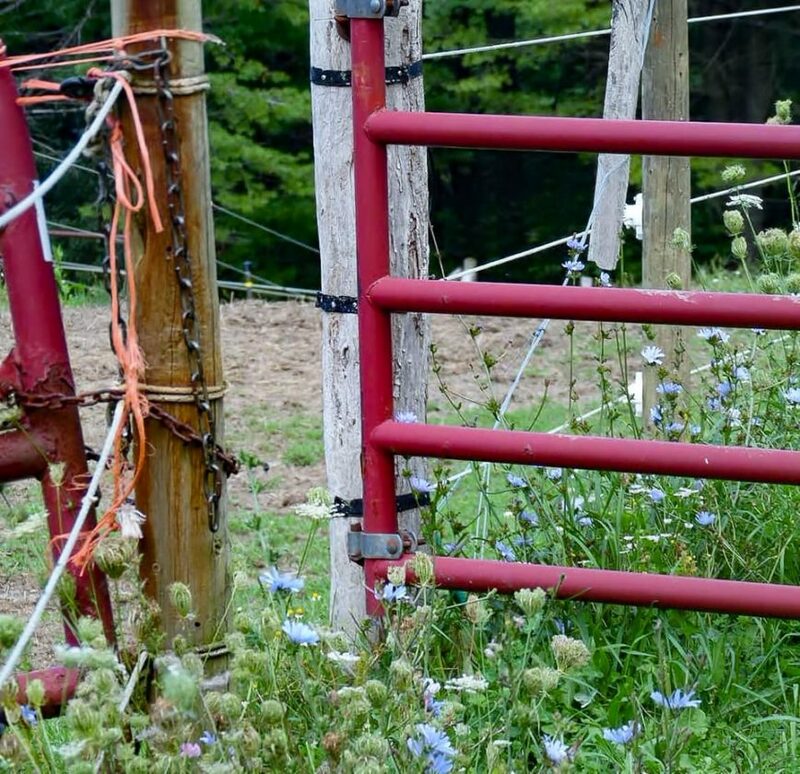 I rode thoroughbreds and thoroughbred-crosses at a farm called Coffee Creek Farm in Austinburg, Ohio, from 1959-64. I showed in hunter classes– equitation, confirmation, over fences. I took lessons from a not-to-be-messed-with woman named Mary Lou whom we called Lou. She took no prisoners. If you hurt yourself, too bad. If you fell off, get back on. If you were scared of a big jump, she would simply turn her face away from you in shame. It taught me, balance yourself. Stay in your seat. Know where you’re going. It taught me to ask myself, Who’s in charge here? Little girl, it’s you. Now I’m old and sitting on a bench at this recreational, therapeutic riding center where kind folks take in special horses who have just the right personalities. “We work with them. Oh yes, we give them second chances and turn them into student mounts,” says barn director Jean. Here they rehabilitate horses and people like me, one by one, walking by our side, mumbling encouragement, ignoring our infirmities, championing us whoever we are and whatever we can do, little or much. It’s noble work with noble creatures. When I leave, I can’t bear to say farewell to Saigon. He’s haunted. Me, too. We had our moment, and I won’t forget. For further information on this fine place and its good works, go to http://www.centaurstride.org/ and contact Jean or Savannah Centaur Stride, Inc.